If you plan to leave your dog at home during the eight hours or so while you’re at work, or if you just plan to be out of the house for a while, your pooch is going to at least need a potty break and maybe a bit more care. There are several options when it comes to caring for your dog when you leave the house. A doggy daycare can be a fun place for your pup to meet fellow canines and fight loneliness. A dog walker will provide your pooch with some company and a nice bit of exercise, along with a much-needed chance to do their business outside. A pet sitter will give your dog even more companionship through the day while your away and address any of your dog’s special needs. Whether you ultimately go with doggy daycare or instead choose to hire dog walker or sitter depends on the needs of your pup and the quality of each option in your area. Either way, you’ll want to check references for any potential caretaker and ensure that he or she can respond to medical emergencies. Here are a few things to consider when picking someone to take care of your dog while you’re away from home. Doggy daycare may not be for every pooch, especially those who lack socialization training or suffer from anxiety near other dogs. However, in some cases, it’s an absolute necessity, alleviating boredom and offering essential human and canine interaction for dogs who would otherwise spend long days alone. While not a substitute for the quality time your dog needs with you, daycare goes a long way toward keeping your dog happy and out of trouble. Your dog will keep up on their socialization skills. Your dog will make new canine friends. Daycare workers can keep notes and report cards for your pup. Dogs get a chance to run around and spend a lot of energy, which will reduce boredom, anxiety, and unwanted behavior at home. You don’t have to worry about accidents or destructive behavior in your home while you’re away. 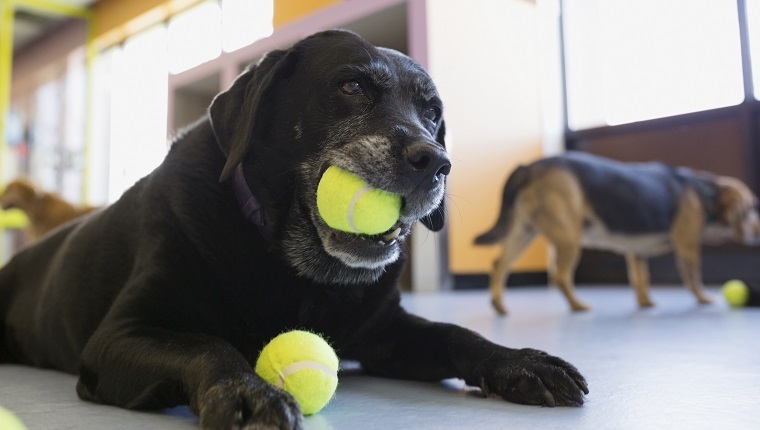 The daycare workers care for multiple dogs, so your pup may not get as much one-on-one care. If your dog isn’t socialized, they will probably not be allowed to attend. The cost can be quite high for a good doggy daycare. 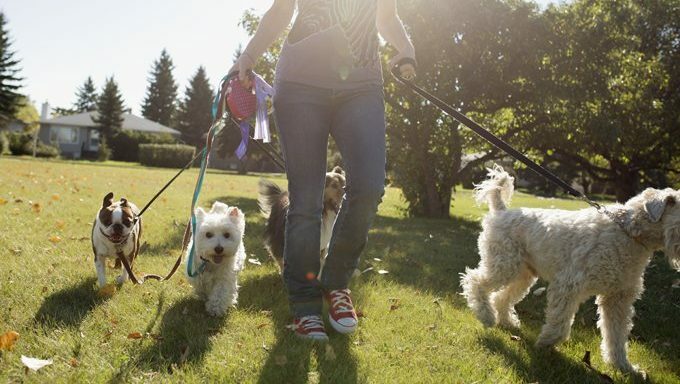 If your dog only needs a potty break and a good, long walk to meet their exercise needs and prevent accidents in the house, a dog walker might be the right option for you. Dog walkers will show up to your home and take care of your dog’s needs for a certain amount of time. Usually, walks last about a half hour or hour, though you can usually schedule more time or multiple visits through the day if your dog needs them. The cost of a dog walker is typically lower than a full day at daycare or a pet sitter, so this is certainly an option to consider if your dog doesn’t have too many extra needs throughout the day. Some dog walkers walk multiple dogs at the same time from different households. It’s best to hire a dog walker that will only walk your dog during your scheduled time. That way your dog gets the walker’s full attention and care instead of having to share it with potentially unfamiliar pooches. They’re usually cheaper than doggy daycare or pet sitters. Your dog gets the exercise and potty breaks they need. Dog walkers can leave notes on how your dog is doing. They typically stick to a regular schedule so you know exactly when your dog is getting a walk and when it’s over. You need to trust someone to come into your home and lock up when they’re done. Your dog only gets care for the time scheduled, not the full day. Some walkers walk multiple dogs at the same time, so your pup might not get individual attention. If your dog has an emergency while the walker is not there, you won’t have a way to know unless you have a home security feed that you can check. A pet sitter is someone who will come over to your home while you’re away and take care of your dog for the full time until you return home. They will usually stay in your house, though some will allow you to drop your pooch off at their home. It’s best for the pet sitter to stay at your house so your dog can be in a familiar setting. Pet sitters can stay for the day, or they can stay overnight if you’re away traveling. With a pet sitter, your dog will get one-on-one care. All of your dog’s special needs can be addressed by a single person who gives them full attention. 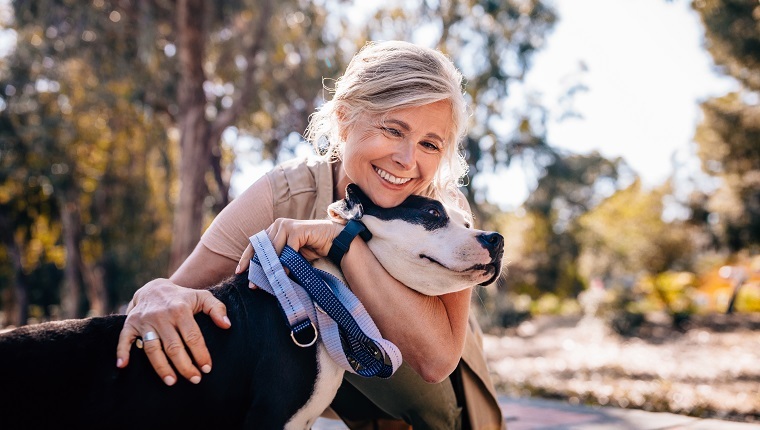 This is an especially effective option for puppies, senior dogs, dogs with separation anxiety, or dogs with chronic medical conditions like diabetes. You can give your pet sitter a lot of specific instructions and rest easy knowing that your dog is the only animal currently in their care. Your dog’s care can be very individualized and specific. The pet sitter will be around all or most of the day, so your dog won’t get lonely. You have someone you can call any time you want to check in on your dog. Your pet sitter can also do things like bring in your mail and water your plants. You have to be able to trust someone to stay in your home. The cost can get high, especially if you’re gone for several days. Do you rely on a daycare, walker, or sitter to care for your dog during the day? Which would you recommend? Let us know in the comments below!